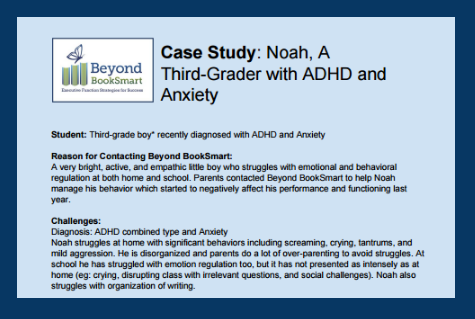 Noah is a bright, active boy who struggled with self-regulation of his emotions and behavior. His parents turned to coaching when those struggles started affecting both home and school functioning. 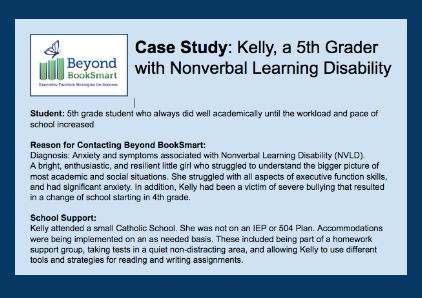 Kelly is an enthusiastic and resilient little girl who struggled to keep pace with increasing academic demands. She had trouble understanding the big picture in many situations. 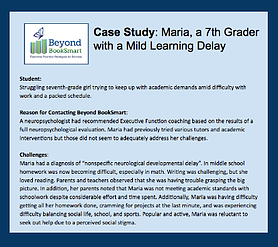 Popular and active, Maria was reluctant to seek out help due to a perceived social stigma. She struggled with writing and math and the demands of middle school. 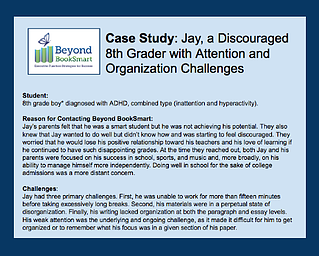 Jay's challenges with attention, organization, and writing left him feeling discouraged and resistant to his parents' help. 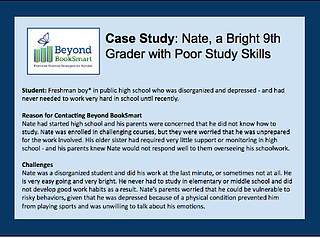 Nate is a bright and disorganized boy who never had to work hard in school until freshman year. 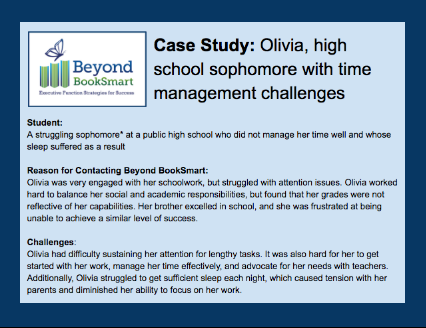 Olivia has attention challenges that interfere with her work habits and lead to late nights and poor sleep. 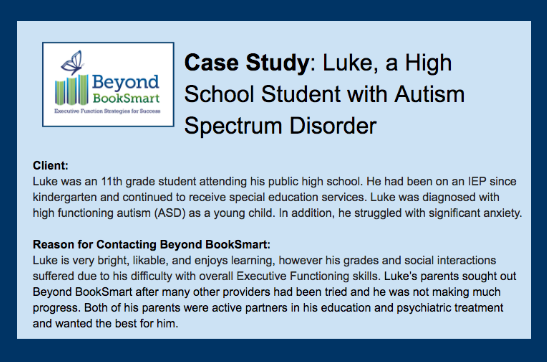 Luke had significant anxiety, as well as trouble breaking down tasks and advocating for himself. 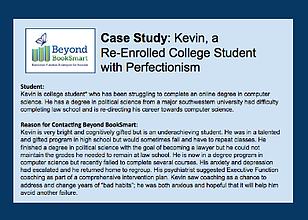 Kevin is an intellectually gifted student whose perfectionistic style has hindered him from completing work and earning credit for classes. 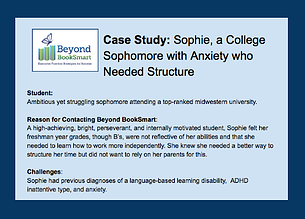 An ambitious student, Sophie wanted greater independence from parental monitoring. She also struggled with self-doubt in her writing skills. 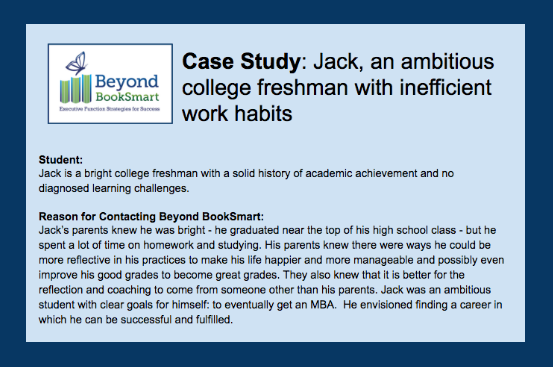 Jack was a high-achieving student without any diagnosed learning challenges — yet he struggled with time management and sustained attention. Andrew was frustrated by leading meetings that were too long and having unproductive days filled with distractions. 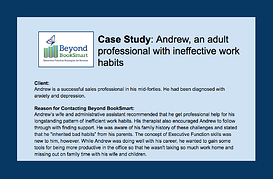 He wanted to learn better ways to manage his work responsibilities so he could spend more time with his family.